E3 2017 looks to be an especially interesting show this year thanks to how competitive the console space has become due to the recent success of both Nintendo and Microsoft. While those companies will continue trying to catch up to Sony, three separate third-party publishers are holding their own press conferences. It’s the same three studios as last year, as Bethesda, Electronic Arts and Ubisoft will be presenting plenty of new details on upcoming releases. Electronic Arts will kick off E3 2017 unofficially (as they’re holding their own separate EA Play event) with their press conference on Saturday, June 10 (12PM PT / 3PM ET). Bethesda follows Microsoft the next night with their third annual E3 press conference (7PM PT / 10PM ET). Then on Monday, Ubisoft will show off their latest and greatest games (at 1PM PT / 4PM ET) before Sony’s press conference takes place. To help get you ready for what will be a busy week, PlayStation LifeStyle has put together a preview for these third-party press conferences. We’ll let you know what’s confirmed to be at the show, what rumors are circulating, and what hopefully will be announced. We hope you enjoyed our preview of the several third-party press conferences that will be a part of E3 2017. In addition to these three shows, Devolver Digital will also be holding an event to announce a bunch of exciting indie game news. There’s no time or date yet for that conference, but we’ll update the post when it becomes available. There are a lot of exciting games being developed from these major publishers, and we can’t wait to see what surprises they have in store for the gaming world! 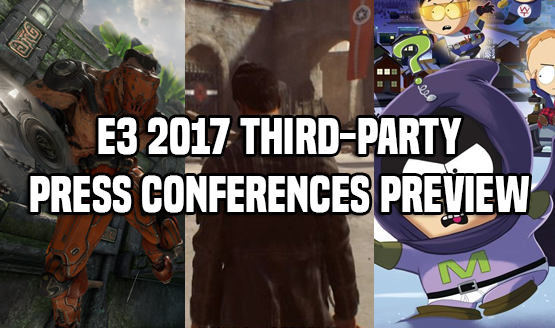 Let me know in the comments which E3 press conference you are most looking forward to at E3 2017, and if you’re disappointed Square Enix isn’t holding a press conference this year!